ESL school administrators are in search of programs, strategies, and practices to keep up with the quickly growing population of students, who need to develop English proficiency while mastering academic content. ESL programs are at their historical peak of development - which, of course, is a great thing! However, planning and implementing an effective program is no easy task. Program selection and development takes a number of practical considerations, ranging from curriculum research to the availability of resources. That’s why we at Your Agora dug into research for the best possible answer to an important question - What makes a successful ESL program? We take the success of ESL students very seriously. That’s why each area of this guide has been thoroughly researched, using the experience of seasoned administrators, along with the latest academic studies on educational policy, classroom management, and the psychology of learning and staff morale. We believe that by focusing on these fundamentals, your program will not only take root and grow, but give your students the skills they'll use for life. Schools may choose from a wide selection of program models that provide instruction and support for ELLs. When selecting a model, school leaders often ask for evidence on the most effective option. However, different models may be appropriate for different settings. It is crucial to recognize and set priorities and goals that are appropriate for your school in particular. For example, each has a different level of student inclusivity into their learning environment - a factor that will most directly influence your students. There are two general types of English language instruction - ESL instruction and bilingual instruction. Unlike bilingual instruction, ESL programs are most often used when the language minority population in a given area represents a variety of languages. The ESL program, which is also more common, accommodates students from different language backgrounds within the same class. Teachers do not need to be proficient in the native language of their student to carry out instruction. The POPI model works well in schools that are process-focused, as compared to content-driven. It works by either pulling students out of class for a period of time, or having students receive ESL instruction during their general ed classes. ESL Pull-Out: ELLs are placed in mainstream classrooms but spend a portion of the day developing their English language skills with specialists, either one-on-one or in small groups. ESL Pull-In: Students receive instruction during a regular class period and usually receive course credit. They may be grouped for instruction according to their level of English proficiency. 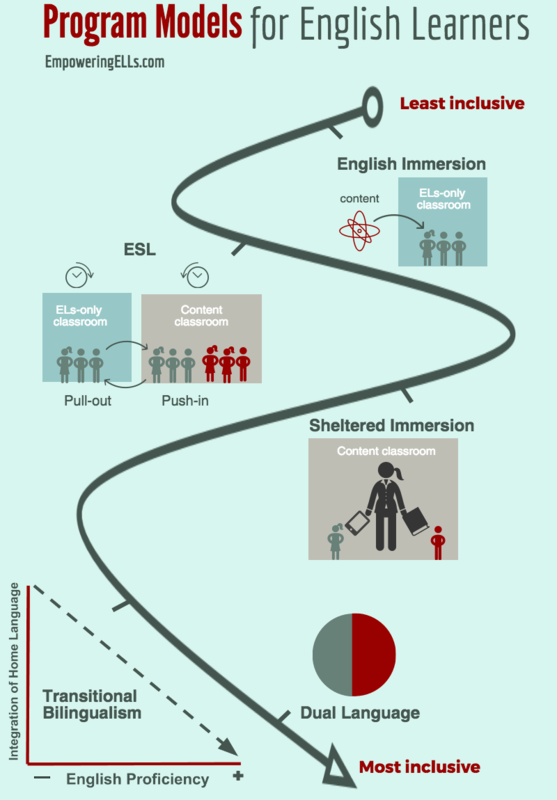 The ESL Resource Center: A variation of the pull-out design, this method brings in students from different classrooms or even schools. The resource center concentrates instruction materials and staff in one location with at least one full-time ESL teacher. Otherwise known as Content-based English Instruction, Sheltered Immersion brings English language learning directly into the classroom. ELTs and general ed teachers co- plan instruction, connecting academic content and language learning. Pro: Encourages collaboration between ESL teachers and general education teachers, instead of outsourcing content instruction to ELTS. Con: Funding will be needed for extensive training of all instructors. This model uses the student’s native language as part of ESL instruction. These programs are usually implemented in areas with a large number of students from the same background. Students are grouped by their native language. Teachers are required to be proficient in both English and the students’ language to carry out instruction. Early-Exit: Instruction in the first language is phased out rapidly, with most students mainstreamed to the regular classroom within the first two years. Late-Exit: These differ from early-exit programs "primarily in the amount and duration that English is used for instruction as well as the length of time students are to participate in each program.” Students remain in the program, receiving nearly half of their instruction in their first language, even after they are classified as fluent in elementary school. All students alternate between learning in one language to the other, from class to class, or day to day. Pro: Improves both native language and English, leading to improvement of critical thinking and communication skills. Also frequently used by schools with a large group students speaking the same language. It’s crucial to choose an appropriate model and ensure it is well understood by all staff members. Inclusivity plays an important role in whichever you select - make sure give it high priority it as part of your evaluation process. Full understanding of students’ needs ensures both curriculum development and improves instruction. Assessing the students’ needs leads to finding gaps in knowledge, as well as displaying room for growth through effective and level-appropriate instruction. The focus of the program determines the purpose, goals and approach that will guide its journey. The basis of the focus should be in literacy, the context in which you program operates, and the needs of your students. A set of clear desired outcomes, which may cover the areas of Reading, Writing, Listening, and Speaking, should be specific, measurable, and attainable within a set time period. Every successful program keeps tight records of its outcomes and uses them for development purposes. Integrated assessment allows you to see the results of student learning. The assessment reviews that your program is true to its focus, is effective, and provides flexibility in response to the needs of students and the community. Assessment should reach both classroom and management levels, to promote accountability and encourage progress. Demonstrated accountability ensures that all staff holds confidence in the program, and are committed to helping students build the skills and knowledge they need. Strengths and weaknesses should always be discussed in an open and constructive manner. The ultimate ESL classroom combines all four teaching methods for a well-rounded, content-based learning experience. When developing the curriculum, it is crucial to recognize these various methods and ensure that they are effectively integrated into instruction. International students are moving away from using agents and recruitment firms when searching for an ESL program, taking the selection process into their own hands. The internet has become the preferred method for searching. With the changing marketplace, it is crucial for your school to focus on having a visible digital presence. In particular, social media is an essential element of your school’s recruitment strategy. Each institution will have its own particular niche audience – local, abroad, or perhaps both. Are you seeking out high school graduates from Vietnam? Do you need to attract parents of elementary students to get their children involved in an ESL camp? 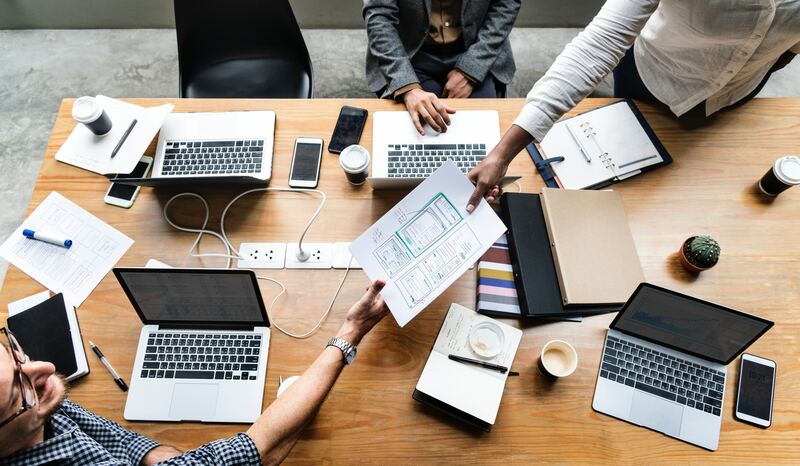 Understanding your audience’s motivations, concerns, and decision-making behaviors is crucial for creating social media communities for recruitment. What is it you hope to achieve on social media? Which outcomes matter the most to you? Consider your specific targets and time frames in a realistic and attainable way. Your goals will define the path which your social media campaigns and overall presence will follow. They are a crucial step in each part of the process - new content, outreach and evaluation. Setting up social media accounts is simple - there are plenty of channels that allow you to present your school in various perspectives. However, attracting and engaging the audience on those platforms with relevant and up-to-date content is quite a bit more work! Consider adding contests, quizzes, student testimonials, and audience-targeted news as part of your purposeful content library. 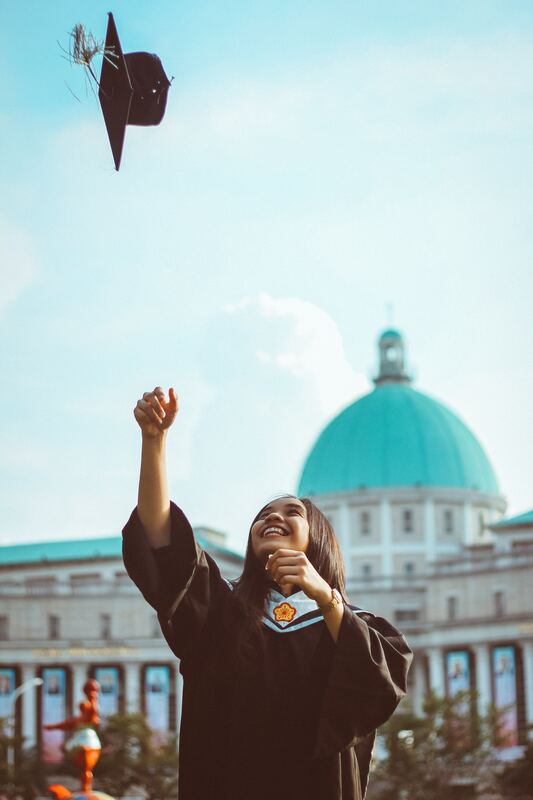 Take advantage of platforms including College Prowler and College Confidential, which are popular among US students for sharing candid thoughts about colleges or the ones they have considered. Other countries have similar platforms for other audiences, as well. For example, in China, students use Chasedream.com for the same purpose. VietAbroader is geared towards helping Vietnamese students find study abroad opportunities. Institutions can consider advertising on such sites, or at the very least, monitoring their brand presence. Check out our article to learn more about optimizing your school’s performance with the help of social media! Context evaluation: considers different variables within the school, such as the ESL student population, and makes decisions with regards to the site. Input evaluation: reviews available resources and makes necessary modifications as per results of the context evaluation. The first two types of evaluation are the foundation for the ongoing need analysis. Needs analysis is important in terms of students’ involvement in every phase of the educational process. Studies indicate that it is necessary to know about learners’ needs, such as their objectives, language attitudes, expectations from the course and learning habits to support your students and design an efficient curriculum. The final two steps of evaluation examine the process and the final result, searching for areas deep in the system that may need addressing. Process evaluation: identifies current problems within the school or a specific program, and reviews the process with which those issues are currently addressed. Product evaluation: reflects on the reports of final results of the program in a set time period. The results may include student improvement and overall performance. Impact Assessment - Has the program achieved its initial goals? Cost-Benefits Assessment - Are the benefits of the ESL program worth the budget it received, as compared to other programs? Coverage Assessment - How many students did the program serve directly? Service Delivery Assessment - Did the program deliver the services it promised in high quality and ease of access? Accountancy Assessment - Is there appropriate accountability for the program? Legal Assessment - Are there provisions for possible legal concerns? * Keep in mind that many ESL programs may be subject to an OCR audit, a US Department of Education requirement, which may evaluate your program in accordance to the Civil Rights statute. You know what a successful program can't go without? An effective, state-of-the-art ESL teaching aid software! Your Agora combines user-friendly tools and sophisticated software to help teachers and students guide your ESL program on the path of success. Check out the library of teaching materials, such as worksheets and vocabulary lists, auto grading and scheduling, and much more. Make your ESL program smarter and easier. Your teachers and students will thank you!